“We’ll stop at the temple on the way out!“ My father is emphatic. Whenever I have a concert he insists on breaking the proverbial coconut at the corner Ganesha temple. While I have last minute jitters of getting to the concert venue on time, my father nonchalantly goes about the business of propitiating the elephant God. As another Vinayaka Chaturthi festival passes by, I find myself wondering why Ganesha seems to figure in our lives only when we need something to happen. To test my hypothesis I began quizzing my friends and neighbours. Rita, my neighbour’s daughter was my first interviewee. I asked her about her temple routine. “When my exam results are due, I do several rounds of the temple with multiple offerings of flowers and fruits.” “What happens between exams?” I asked. “Oh, just one round, sometimes a coconut thrown in!” Last week when another friend underwent a battery of tests with her doctor, the “modaka” preparations at her home gained astronomical importance. As always my husband had his own take on matters. 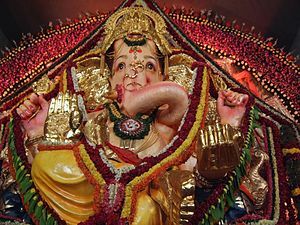 “Ganesha is probably the most overworked God among the Hindu pantheon today” he declared pompously – ensuring he was out of my father’s earshot. Having grown up in a traditional family bound to the lunar calendar and every Hindu festival on it I never did question my beliefs. Today as the mother of two girls who question everything and want to know why we are doing something, I feel the picture of Swami Vivekananda in my living room mocks my passive acceptance. My friend who lives in the US scoffs at my “silly spiritual struggles” as he terms it. “I don’t believe in visiting temples or undertaking pujas. God resides in every human being!” Strangely enough when he comes visiting, a trip to Tirupati with his parents always features in his itinerary. I’m sure he doesn’t go there for just the scenic beauty! Next Taking it as well as you dish it out..